Digitimes and CNET have reported that Google is working to expand its lineup of Nexus tablets. The rumors state that Google plans to launch a high-end 10-inch model and a low-end model priced at $99, in the first half of 2013. Google is said to be partnering with Samsung for the 10-inch tablet, while the OEM partner for the $99 device is still unknown as Asus denied any involvement. While further details are scarce, let's take a deeper look at these rumors. Currently, tablet demand is still more or less concentrated in the US market. The primary reason for this is that tablet prices are still considerably high for the average consumer to consider. While the Nexus 7 and Kindle Fire have helped bring prices down, tablet prices are still considerably high for a mainstream consumer in emerging markets. The primary goal of a $99 Nexus tablet would be to jumpstart demand for tablets in these markets. A successful launch in could drive volumes sky-high, potentially increasing OEM interest as well. The one major risk I see with this product is that of subsidization. For the device to sell at $99, the manufacturing cost can be no higher than $80-$85 at most. This is a drastic drop from the Nexus 7's $160 BOM cost, and could be a struggle to achieve. I attempted to draft a specification sheet and accompanying BOM estimate, but I could only get it down to about $120 with 4GB storage (although it was based on the original Kindle Fire with dated component costs). Costs could fall further, but Google & the OEM partner may still have to get creative to get costs down to the required level. If Google chooses to sell a subsidized tablet, other OEMs may not be particularly pleased as it wouldn't be a replicable or sustainable strategy. 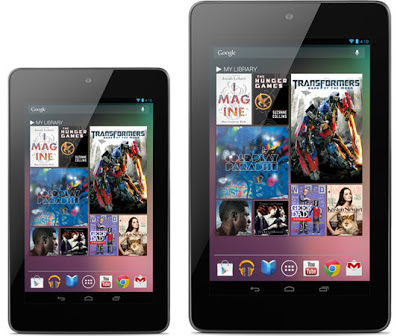 We have a few more details about the 10-inch Nexus tablet, with CNET reporting a retina-like 2560x1600 pixel display. This would be the highest resolution display for any tablet so far, with a pixel density surpassing that of the 3rd generation iPad. CNET also hints at more "cutting edge component tech" in the Nexus 10 tablet, reinforcing its high-end stature. The top of the line display and component technology wouldn't be a major surprise as Samsung would most likely produce them in-house. While the high-resolution display and the Google / Samsung branding could help the device's reception, they would probably need to add a few more tweaks to have a major market success on their hands. Google and Samsung need to add at least one easily marketable feature to draw the consumer attention away from the iPad. Based on the tablet segmentation trends I had highlighted earlier, one solution could be an optional Surface-like smart cover/keyboard or keyboard attachment. This way the Nexus 10 could be positioned as a high-end hybrid tablet with an established ecosystem, as compared to a high-end media tablet with an established ecosystem (iPad) or a high-end hybrid tablet with no ecosystem (Surface RT). Of course, this is just one possible solution and the addition of any other easily marketable (possibly desktop-like) feature could yield similar results. Conclusion - If these rumors are true, the Nexus tablets could be aimed at replicating the Android platform's strategy in the smartphone market, with both low end and high end products at a wide range of prices. While these products could help increase Android tablet adoption across income levels and geographies, they come with their own set of risks and challenges. Those were my initial thoughts as well. But individual reports talking about the same rumors made me doubt that a bit. There's two POVs on updates here. While that would be Google's primary concern, the majority of the target market for that kind of product is unlikely to focus on updates. But considering Google's focus on the Nexus brand, they'll probably play it safe and ensure that it's future proof at least for the next two update cycles. Do you think Google will actually sell a $99 Nexus 7? Based on digitimes latest report, it's supposed to house a single core processor. Based on that, $99 is certainly possible. I wouldn't expect a high quality device though. I'm very interested to see Google's branding strategy for this. The Digitimes article also said "However, Quanta declined to comment and Asustek Computer, a Taiwan-based vendor developing Nexus 7 through cooperation with Google, indicated that it has no plans to launch US$99 Nexus." It never said who its "supply chain sources" were either. This reminds me of the $199 Surface rumor... and we all know how that turned out. I wouldn't dismiss them so easily. Digitimes does have good connections with supply chain executives. Of course, supply chain executives don't necessarily have the best knowledge of downstream decisions. There are a lot of products that aren't launched after an initial test manufacturing phase. This isn't to say that a $99 Nexus tablet will definitely hit the market. Digitimes, because of the upstream sources they have, runs hot & cold.